The price you found is 52% lower than this hotel's average rate of $132/night. Stayed for 4 nights whilst touring France by car. Good location, nice and quiet on a hill overlooking the town and coast. Street parking is difficult so recommend secure hotel underground parking. Large enough room on top floor with great views from balcony, well equipped (incl small fridge) and clean. Friendly enthusiastic staff (gave us free parking to make up for lift not working whilst we were there). A pleasant 10 minute walk will take you to the town and sea front and all that Cannes has to offer. Considering you're in Cannes, the room rates are very good - thoroughly recommend a stay here. Room tip: Top floor for best views. The price you found is 46% lower than this hotel's average rate of $370/night. The price you found is 24% lower than this hotel's average rate of $295/night. The price you found is 20% lower than this hotel's average rate of $219/night. The price you found is 18% lower than this hotel's average rate of $223/night. The price you found is 28% lower than this hotel's average rate of $262/night. Great Little Hotel with Wonderful, Thoughtful staff! Keep in mind we were coming from a bad experience at B&B outside of town which is not even worth naming. So, perhaps some small inconveniences here may be overlooked. We were just very happy they even had space halfway into the festival. The pros: Wonderful, friendly multi-lingual staff greeted us cheerfully but not insincerely. They had a box of wall plug adapters of all kinds, in case you forgot yours. We were given a fairly large room for standard. A good size tv but instant coffee. There's a Casino supermarket a few steps away where we bought real cream for our coffee and some nice croissants and yogurt which we kept in the handy little fridge in the room. There was a little hallway/foyer with a wardrobe to hang your tuxes or gowns and shelves to put your shoes. A couple extra pillows there too. The bed itself was comfortable and the light switches were right there beside the nighttables. The housekeeping was thorough - in fact we were in such a hurry one day we left the room a mess and felt guilty since the housekeeper worked around our mess without touching our things. We cleaned up for them that night, albeit to her relief. The bathroom was okay with an extra shaving/makeup mirror and little stool to sit upon. The soap/shampoo was apparently 'green eco'. It took me a day to figure out you had to squeeze the bottle for the product to come out. Too simple! There was a good strong hairdryer which was nice since we didn't pack ours. Nice big fluffy towels and bathrobes and slippers. The view wasn't bad, it looked out upon the street. But, understandably during the festival, it was a bit noisy on the weekend nights. The lobby is small but welcoming and the outside has a couple little chairs and tables to lounge and wait for your slow colleagues or family members. We did, indeed, have a small issue with the internet for a short period on the second day, but the rest of the time it was just fine. Seemingly, no fan in the bathroom - a minor thing but a bit uncomfortable in the heat and if you have to jump right out in a hurry to do your makeup in front of a steamed up mirror. Also, not much counter space for your toiletries - and we had a lot. Perhaps they could put in a little toiletry trolley. Just a suggestion since there would be a bit of room for it. Although neat and tidy, the breakfast could use a wee bit more variety, but they had good, strong coffee and cream, which was fine for me. 12 Euros and not included in our room rate though. Coffee, tea, hot chocolate for the kids, juice, fruit, boiled eggs, individual swiss cheese in packages so you can nick some for a snack during the day ;), sliced ham and turkey, yogurt and croissants and bread. Close to the train station, but if you're not used to walking or have a tight schedule, a bit of a trek to the Palais - about 10 -15 minutes, depending on your pace. If you have small children, it might be far for them if you're walking into or back from town for shopping. However, this could be in the 'pro' section if you need to tone up for your gowns or tux anyway. We didn't use the pool, so can't comment. But we did hear people playing in it and it sounded like they were having fun. We would perhaps book this again on a vacation but because of the walk perhaps not for the festival. But that's just us. This hotel is perfectly fine for your needs if you are casually visiting Cannes on holiday. Room tip: Our corner suite was larger but a bit more noisy than perhaps higher floors. Overall a decent hotel; about a 10 minute walk into the heart of downtown Cannes. The hotel was clean, rooms are a good size with a nice little balcony to relax on. Price was reasonable too. One thing to note; when we booked the hotel it was advertised as having "free parking" which isn't exactly accurate. It has an underground lot but it costs €15 per night. The "free parking" option is only if you can find a spot on the street in the surrounding neighbourhood, which is not metered. That said, it parking is at a premium in the area so you may find yourself walking a bit of a distance to/from your car if you don't just bite the bullet and pay to park at the hotel. It is a small but quiet hotel. The rooms are small but very clean. Finding this place in the last minute for only one night to sleep, for me was great. Indeed you have to pay for almost everything extra: parking, I found a public parking nearby and it was ok; breakfast, stuff you find in the room. All and all I give it a thumbs up for being close by to the beach, nice, clean and warm rooms during the cold season and decent wifi coverage. I decided to stay here due to the Hotel's location. Except for tea and coffee, nothing is free in the rooms, however the prices are pretty reasonable. Room was clean, however doesn't look that modern. My rating is based on the annoying wifi signal. My room is one floor below the reception, however none of my devices had access to internet. Since I was in town for business, having access to my emails at night was extremely important. Room tip: Do not get the rooms that are below the reception if you need access to internet. 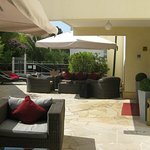 Nice little hotel in walking distance to the city of Cannes and the beaches. The rooms are small but quietly. The prices are o.k. They have a pool and a jacuzzi. We did not have the breakfast, beacause of several "Brasserie" in the area.